The author of this website has been blessed to have traveled across South Louisiana since 1994 and helped to open new adoration chapels as well as increase attendance at chaples that were already in existence. 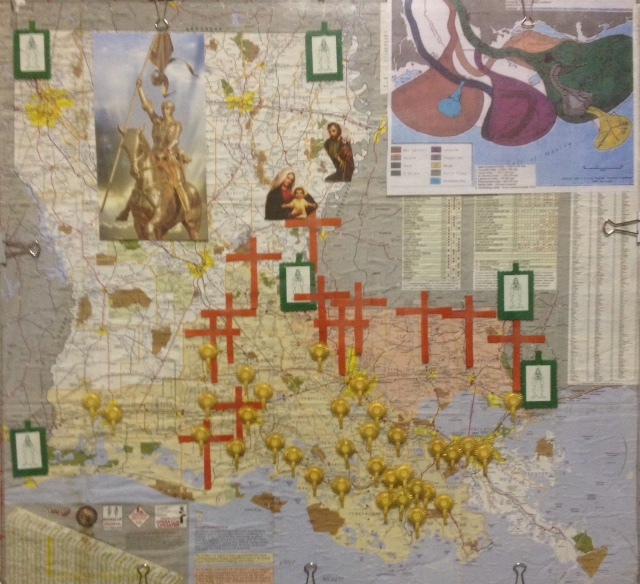 The explosion of Eucharistic Adoration across South Louisiana is all a part of who we are. 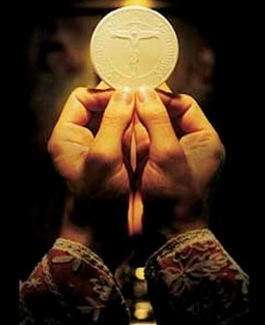 The smaller we are, the more we can be a Eucharistic People. 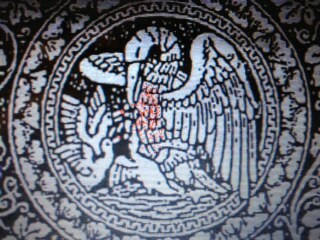 There is much more on that (the "Anawim" throughout these webpages. (If you want to know more about this, please contact us at macleanland@bellsouth.net or 985-856-5345. If you know of a new chapel opening in you area or if there is some way we can help you increase the number of adorers at your existing chapel, please let us know. 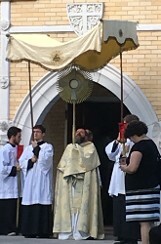 From a theological perspective, it is important to emphasize that a procession is a sign of the Church’s condition, the pilgrimage of the People of God, with Christ and after Christ, aware that in this world it has no lasting dwelling. Through the streets of this earth it moves towards the heavenly Jerusalem. It is also a sign of the witness to the faith that every Christian community is obliged to give to the Lord in the structures of civil society. It is also a sign of the Church’s missionary task which reaches back to her origins and the Lord’s command (cf. Mt 28, 19-20), which sent her to proclaim the Gospel message of salvation. 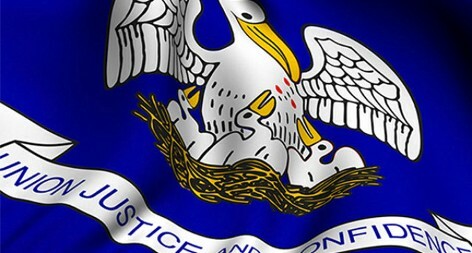 CLICK HERE FOR MORE INSPIRING INFORMATION ABOUT THE PELICAN FEEDING HER BABY CHICKS, THE EUCHARIST, THE CORRECT DEPICTION OF OUR STATE SYMBOL AND A HOUMA, LOUISIANA RESIDENT WHO WAS CONVICTED TO GET IT CORRECT! When we meet God face to face in eternity, we will grieve over each Mass that we could have attended but did not attend due to some reason we now consider more important. 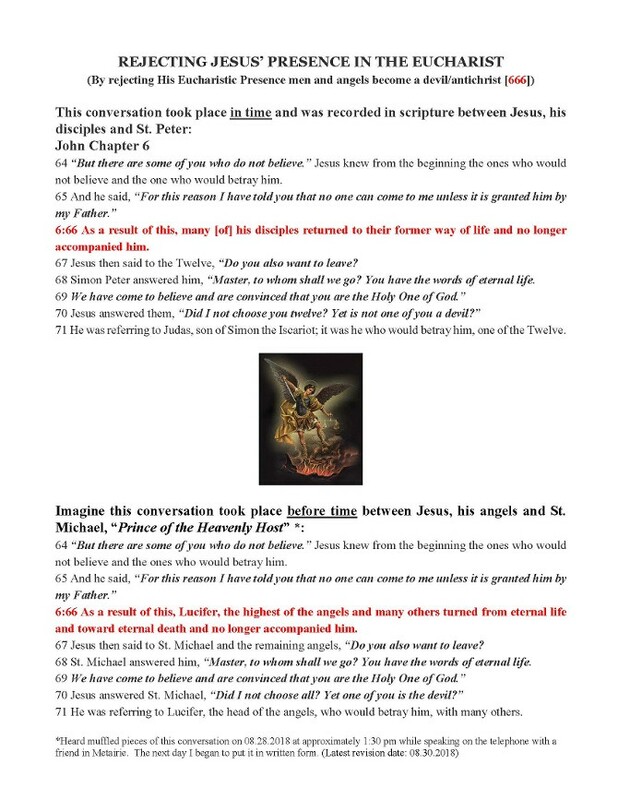 To read Bishop Emeritus Sam Jacobs' teaching on the Eucharist, click on the photo immediately below. GO TO MASS DAILY, IF AT ALL POSSIBLE! Between Masses, as you travel across Louisiana, visit Jesus present in the Blessed Sacrament in the Adoration Chapels across the State. To try and do that, review the chapels across the State listed below. Make Mass and then Adoration of the Eucharist between Masses the most important part of your day. You will never be sorry about devoting that time to Jesus. Having a problem doing that, ask your Guardian Angel to inspire you to attend Mass daily and then to get you to a Mass! It will happen! In between Masses spend time in Eucharistic Adoration! 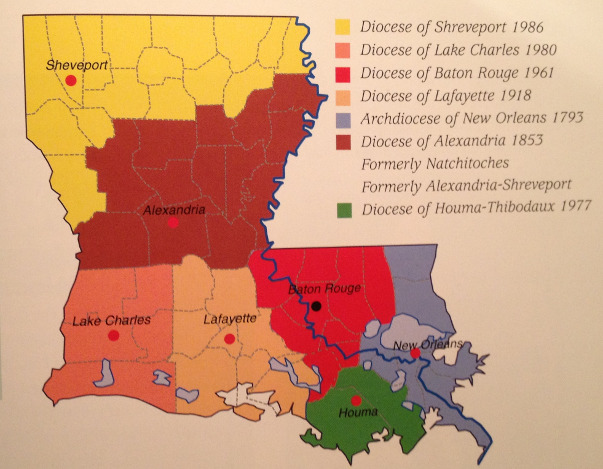 Eucharistic chapels across South Louisiana. Where you see no monstrance, there are wetlands...no land! Below is a listing of the Adoration Chapels that are believed to be either 24/7 now or are capable of extending their hours to 24/7. 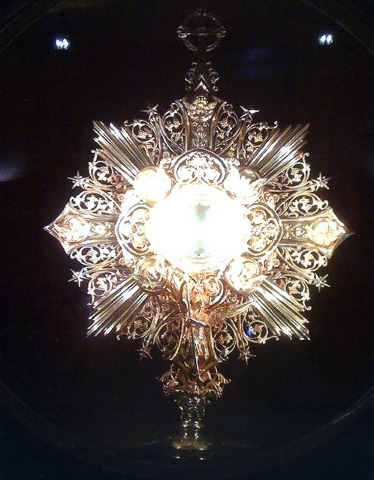 If you want to know more about the present times of adoration, call the parish. 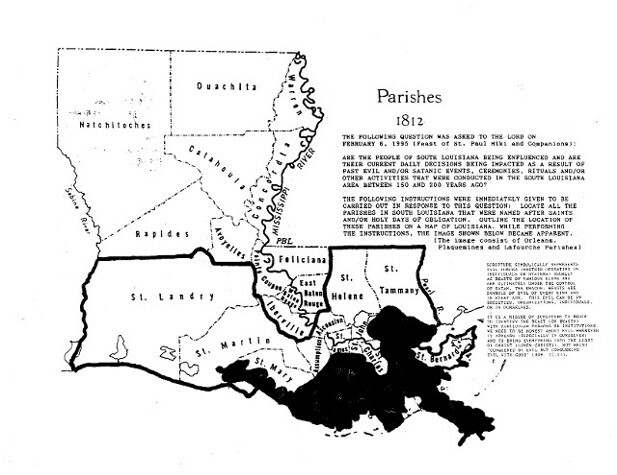 (If your parish [or a parish you are aware of] has been accidently left off the list or if a chapel is listed below that no longer exists, please let us know at macleanland@bellsouth.net. We would like to have a listing of the total "Adoration Network" across the State of Louisiana so that as Catholics move around Louisiana it will become easy to stop during the day and spend time with Jesus. It is believed that there will be a time come when these chapels will not be large enough to accomodate all the Catholics that want to adore Jesus truly and substantially present in the Holy Eucharist. 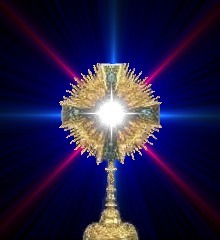 Due to the great attendance in those days, Eucharistic Adoration will be in the churches!!! For these and even more locations, click here! IN THE DIVINE WILL, ONE CAN BECOME MORE EUCHARISTIC AND ONE CAN ACTUALLY BECOME A WALKING TABERNACLE DOING THE WILL OF GOD. TO LEARN MORE ABOUT THE DIVINE WILL SPIRITUALITY, CLICK HERE. 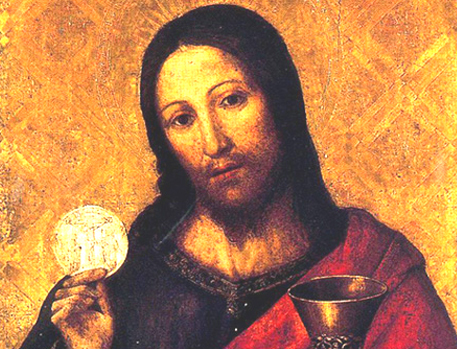 BE A PART OF A EUCHARISTIC MOVEMENT TO BRING LIGHT BACK INTO THE DARKNESS OF GENERATIONS! I will put enmity between you and the woman, and between your offspring and hers; They will strike at your head, while you strike at their heel. 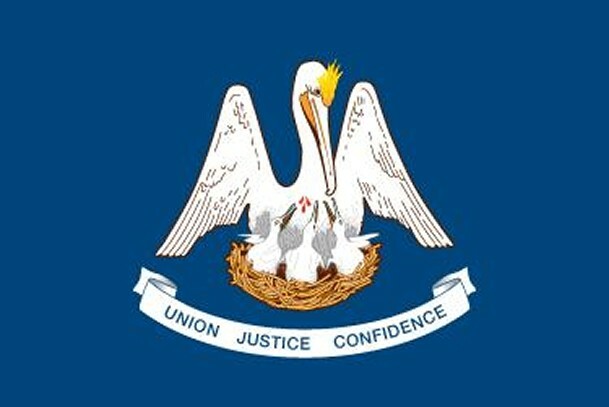 From Archdiocese of New Orleans (the ball) to the Diocese of Lake Charles (the heel), Our Lady's Louisiana offspring is to play a unique role the crushing the head of satan.